Should Advertisers Worry About Consumer Data? For more than a decade now, users of social media platforms and internet services have been providing personal data to companies like Facebook, Google, and Yahoo! in exchange for free services like online communities, email, and storage space. The value proposition is straightforward: We give the companies some personal information – name, birthdate, and where we live – and permission to track our activity when using said services, and they let us use their software. In turn, this data drives advertising models. It’s a bit more complicated than that, but not much. However, several high profile events over the past couple of years – some directly related to web services, others on the periphery – have presented potential threats to this seemingly too-good-to-be true business model. Take your pick of which event might have raised your ire, as there’s something for everybody: Cambridge Analytica’s hacking of 50+ million Facebook accounts to support its efforts during the 2016 U.S. presidential elections (followed by the hacking of its entire user population); Yahoo’s admission in late 2017 of a massive breach of its 3 billion user base; or the Equifax compromise that affected 300+ million accounts, which the company is still trying to sort out, a year after its announcement. These followed other newsworthy problems in the mid-2010s involving household brands like eBay and Target, which themselves followed the TJX credit card breach, which involved about 45 million records. Though, of course, we can’t predict the next meaningful breach, the past decade or so tells us that we’ll experience a least a couple each year for the foreseeable future. Hackers are an ingenuitive bunch, apparently. The motivation behind the efforts ranges from the acquisition of political power to greed and just plain hooliganism. For advertisers, though, the big question is: Do consumers care enough about these threats to change their behavior? Is there a shift in consumer behavior underway? According to new research from Pew Research Center, we could be seeing signs of shifting consumer behavior. 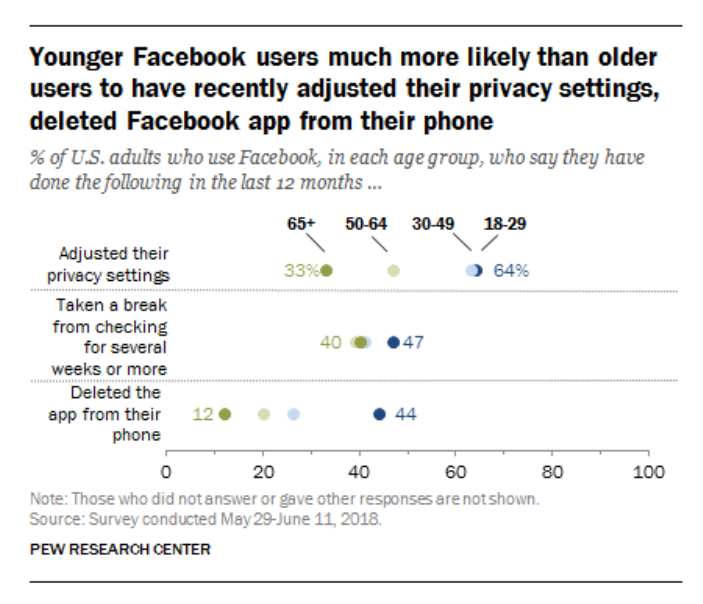 According to its survey from June, more than half of respondents said they’d adjusted their Facebook privacy settings over the previous year, while 4-in-10 said they’d taken a break of “several weeks or more” from the app, and a not insignificant 25% said they’d deleted the app from their cellphones. As a snapshot, these results are noteworthy, but not shocking. (And it’s too early to tell if they signal a larger trend.) Facebook seems to be approaching market saturation in the U.S., while the coveted teen demographic is using Instagram and Snapchat more frequently. It stands to reason that more experienced users are likely to tinker with privacy settings, as well as occasional bouts of abstinence. While we may be seeing signs of Facebook user behavior evolution, most constraints on consumer data availability in the short term will be driven primarily by government regulations or self-policing actions by Facebook/Google/Yahoo/Verizon. The EU’s General Data Protection Regulation (GDPR) law enacted over the summer is the most obvious example of government involvement, which caused genuine angst among American companies, and instigated modifications and new ideas. It doesn’t seem like U.S. lawmakers will follow suit in the foreseeable future. This is due in equal parts to a lack of understanding of the issues, an administration that espouses deregulation, and attention to a litany of more pressing issues. Given that brands have more consumer data available to them than most can practically deploy for advertising purposes, changes in consumer behavior in response to data breaches like the Facebook-Cambridge Analytica kerfuffle are unlikely to meaningfully impact marketing strategies for the foreseeable future. However, while consumers have historically demonstrated an extraordinary threshold for what they are willing to provide in exchange for free goods and services – and this premise is effectively the lifeblood of companies like Google and Facebook – the combination of high profile breaches, Congressional hearings, and product fatigue could prove to be problematic for the category over the longer term, and it’s certainly something we’ll be watching closely. Tim Bourgeois (@ECoastCatalyst) is a principal at East Coast Catalyst, a Boston-based digital marketing audit company.